This is an excerpt from The Hockey Coaching Bible edited by Joe Bertagna. There are several ways to practice the power-play breakout. As discussed earlier, one of the most important aspects of the breakout is timing. Practice and repetition are required to perfect the timing of the breakout. The simplest way to practice the power-play breakout is to have the players break the puck out without any pressure at all from the penalty-kill forecheck. This will enable the members of the power play to familiarize themselves with their positions and their roles without having to initially worry about pressure from the penalty killers. Power-play players start on the far blue line. The coach stands at center ice with the puck. The coach dumps the puck, and the players move to their breakout positions and start the breakout (figure 14.13). The coach can pressure initially. The progression is to add two, three, and then four penalty killers. 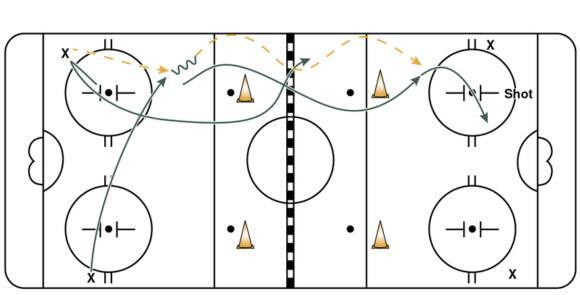 Once the power play has entered the offensive zone, the coach blows the whistle and throws a new puck back into the breakout zone, and the players do it again. The original puck is dead at this point. Give the first power-play group approximately two or three repetitions before switching to the next group. If your team has only half ice during practice, power-play players can start on the red line instead of the far blue line for this drill. Team drill 1: progressive penalty killers. Players start in their offensive zone setup against the penalty kill. Players move the puck for approximately 10 seconds, and then the coach blows the whistle. Once the whistle sounds, the coach throws a puck into the defensive zone, and the power-play unit has to skate back into the zone into breakout position (figure 14.14). The penalty killers then start their forechecks. The drill should run for 40 seconds total, including the 10 seconds to start the drill in the offensive zone. If the power play breaks the puck out easily and gains zone entry, the coach should blow the whistle and throw a new puck back into the defensive zone for them to start again. This is a defenseman-oriented drill. Defenders collect the puck behind the net, move it to their forehands, and either use the net or counter before passing to a player on the wall (figure 14.15). The four-dot chip drill will help players get used to supporting the puck and chipping past forecheckers in the neutral zone. For the four dots, you can use players, coaches, or cones (figure 14.16). Two players start at opposite sides on one end of the ice. The far player skates toward the puck carrier on the other side and receives the puck. He makes a chip pass off the boards that is retrieved by her partner. They continue up the ice, chipping the puck off the boards and skating around the dots, until they reach the other end of the ice. The player with the puck finishes by taking a shot at the net. Individual drill 2: four-dot chip drill.